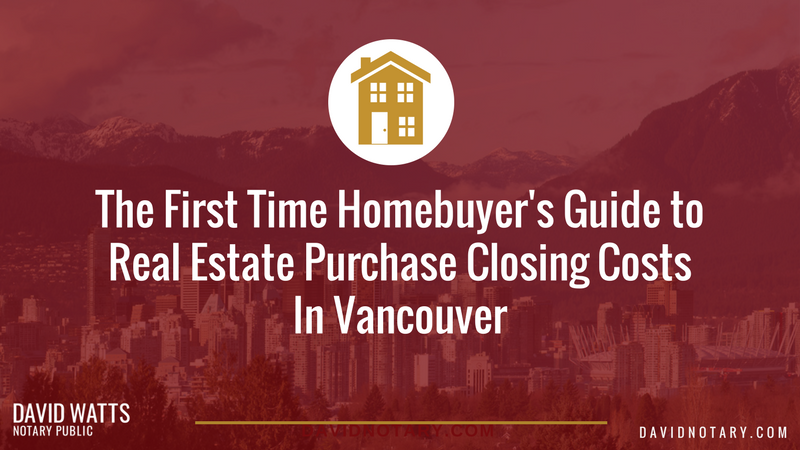 Buying your first house is an exciting (and sometimes nerve-wracking) time. When you’ve never purchased property before, you might be surprised when you find out about some of the costs associated with closing a deal. Budgeting for these costs is important because you’ll be required to show proof you have the funds to cover your downpayment and closing costs to secure your mortgage. This guide will help save you from being surprised by unexpected closing costs. If you’re applying for a mortgage, your bank or lender may also charge a mortgage application fee, though usually only with private rather than institutional lenders. Keep this in mind when you are shopping around for mortgages. 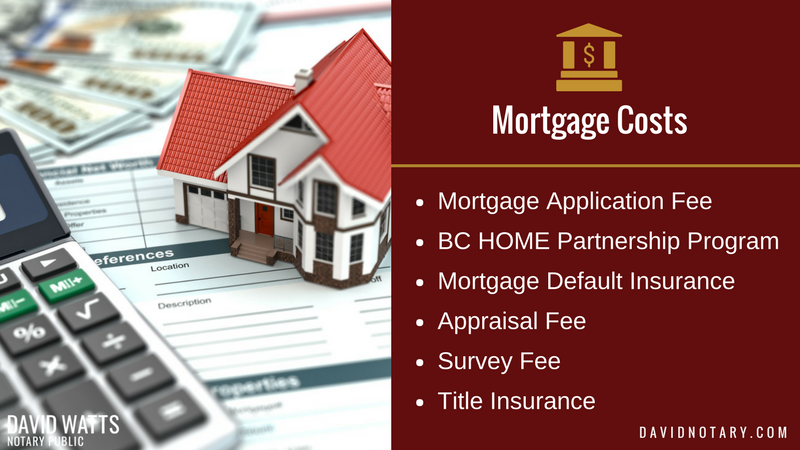 When you are borrowing a portion of your down payment through the BC Home Owner Mortgage and Equity (HOME) Partnership Program, there will be additional fees of $560 for their lawyer fees to complete the loan. Thankfully this isn’t something that you have to pay upfront, it is added to your loan. If you’re taking out a mortgage for over 80% of the appraised value of the house, you will also have to take out a mortgage default insurance. Here is a link to the premium calculator for Canada Mortgage Housing Corporation (CMHC). This ensures that the bank will not lose any money if you cannot make your mortgage payments and the value of your home is not sufficient to repay your debt. If the bank requires an appraisal of the home before approving your loan, you will probably have to pay the appraiser’s fee. Property boundaries and compliance cannot usually be determined without an up to date Survey Certificate. A survey is prepared by a Land Surveyor and the cost varies depending on the region. Your bank may also require that you present a survey certificate that shows exactly where the boundaries of the property are and where the buildings fall within them. If the previous owners can’t provide this certificate, you’ll have to pay for the surveyor’s fee. Many lenders require title insurance before they will advance mortgage funds. Title Insurance may insure the Lender and the Owner in the event of defects in title that are not readily apparent. If you wish to have further information on Title Insurance, please contact my office and I will give you the information to contact a title insurance provider so that you may discuss the limits of coverage with them. In B.C., the provincial government collects a property transfer tax that must be paid before any home can be legally transferred to a new owner. The Property Transfer Tax (PTT) is a tax of 1% on the first $200,000, 2% on the value up to $2,000,000 and 3% of the remaining value of the purchase price. Some buyers (including qualified first-time buyers) may be exempt from this tax. This cost catches many people by surprise. If the current owners have already paid the city in full for the house’s yearly property tax (and utilities if billed separately), then you will have to reimburse them for your share of the year’s taxes. 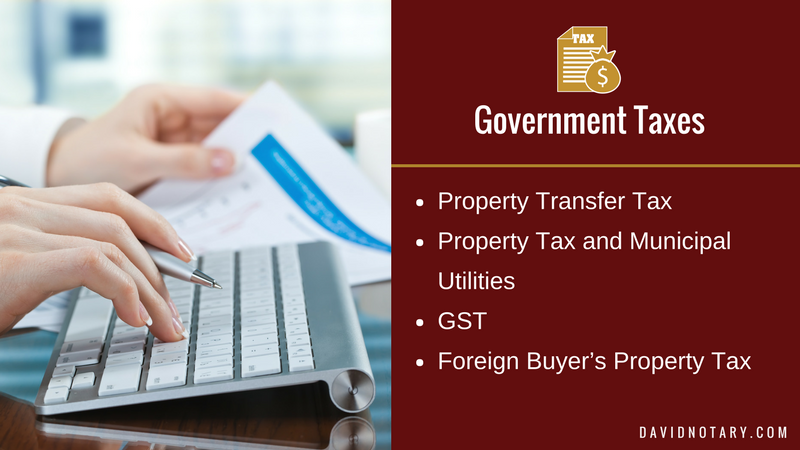 If the home you are purchasing is newly constructed or substantially renovated, you may have to pay 5% of the purchasing price on GST. However, there are some rebates available, depending on the value of the home. In B.C., the government has introduced an additional 15% property transfer tax on foreign nationals, corporations, and trusts that are buying in Metro Vancouver. The tax does not apply to Canadian citizens or permanent residents or foreigners living in Canada on a work permit. While it’s not necessary to have a home inspection, it’s a good investment to make sure you don’t unknowingly become responsible for any major defects of the property. During the purchase process, you will need to hire notary public or a lawyer that will review the contract and title; prepare documentation necessary for the transaction, handle the exchange of funds and register the application to transfer ownership of the property as well as secure the new mortgage. They will charge a fee for their services and disbursements for due diligence requirements. Fees vary from office to office, but are fairly consistent as there is competition is providing this service. You will hear the term “Conveyance” or “Conveyancing” which refers to this process and loosely means to convey legal title of the property from Seller to Buyer. Whenever a title is registered with B.C. Land and Survey, a small fee must be paid. Normally (but not always) this fee is paid for by the lawyer or notary public and included as a disbursement on their accounts. You may be required to reimburse the seller for any utilities (water, sewerage, garbage, recycling, drainage) paid to the city in advance. 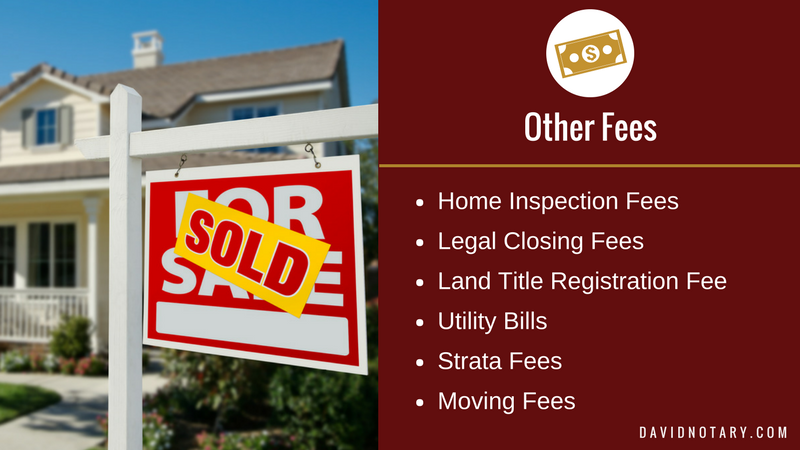 Check with the Strata to find out when your fees are due as you may have to pay them soon after you move in. General moving costs and “Move In” Fees. Moving house costs money. Whether you hire a moving company, or hire a truck and move yourself, you are going to have out of pocket expenses. Many Condominiums in Vancouver also have “Move In” fees. Your notary or lawyer will generally pay these on your behalf. You may also be required to pay for connecting your new utilities in your new home. If you have any questions regarding closing costs or need assistance with your Real Estate transfer, we can help. Contact our office for further information, for a quote on your transaction and to make an appointment for your real estate closing.